Work: Delegate to the Maryland Legislature, 1771; Member of the Committee of Correspondence, Patriot Leader; Elected to Continental Congress, 1774-78, Chief Justice of Maryland, 1778; Elected Governor of Maryland, 1782; Federal District Judge for the State of Maryland, 1789-99. William Paca was born in Abington, Maryland on October 30, 1740. His education in law was impressive. He was tutored at home in the classics before attending Philadelphia College at age fifteen, where he graduated at eighteen with a Masters degree. He then studied law in Annapolis at the office of an eminent lawyer. Before seeking admission to the Bar of Maryland, he attended training at the Inner Temple in England. His political engagement began in his interest in the law. He wrote and organized against a poll-tax originated by the royal governor just prior to the outbreak of hostilities. He was a local leader in the patriot movement in the late 1770s. 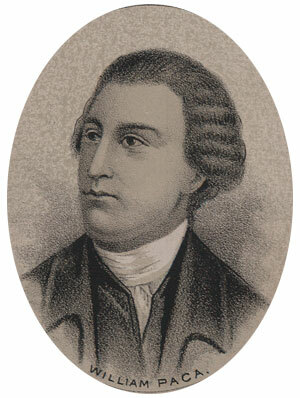 Elected to the State Legislature of Maryland in 1771, he was appointed to the Continental Congress in 1774. He was reelected and served there until 1779 when he was appointed chief justice of the State of Maryland. In 1782 he was elected governor of that state. He was appointed federal district judge for the State of Maryland from 1789, until his death in 1799.